While virtually the whole Church was peacefully following the Roman Rite under Pius XII without evincing the least dissatisfaction, the Congregation of Rites was enthusiastically stirring the pot that would later be served up at Vatican II. That this was originally the work of the 1948 Commission is obvious from the fact that the 1955 Decree Maxima Redemptionis was signed by Card. Micara in his dual capacity as Pro-Prefect of the Congregation of Rites and President of the Commission. Fr. Löw was not only a member of the Commission but, as Vice-Relator of the Congregation of Rites, he was also responsible for editing and presenting the Commission’s ideas to the rest of the Congregation. Another leading Commission member, Fr. 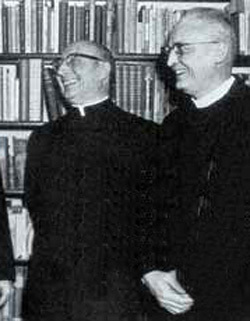 Antonelli, would soon be appointed as Relator-General to the Congregation of Rites (1956), prior to becoming Secretary of the Conciliar Commission for the Liturgy (1962) and Secretary of the Congregation of Rites (1965). This means that the papal Commission was effectively given the power to dictate the reforms on the basis of nothing more than their own prejudices and, furthermore, that Pius XII allowed the inventions of the reformers to take precedence over the rights of the faithful to their own Tradition. It is obvious that this was an overarching, “totalizing” program of reform, leaving no member of the laity unaffected, no individual immune from moral coercion or even harassment. Its implications went far beyond the practicalities of whether to stand or sit, light a candle, use Latin or the vernacular. It was fundamentally about a new ecclesiology, what kind of Church was being planned for the future – one, as it turned out, in which the whole idea of the sacramental Priesthood was to be merged seamlessly into that of the People of God actively engaged around the altar. 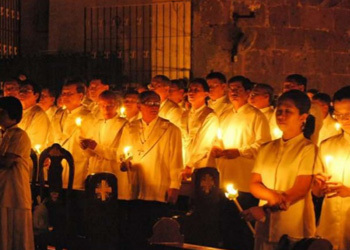 In the Renewal of Baptismal Promises, the people engage in “active participation” by re-lighting their candles – which they had lit and extinguished only a short while earlier – passing the flame on to others in the congregation, balancing a book in one hand and a burning candle in the other, supervising one’s children precariously holding lighted candles, listening and responding to the priest in a “dialogue” and joining him in the communal recitation of the Our Father (as on Good Friday). Juggling so many balls in the air and jumping through various hoops takes the soul, mind and body away from the necessary focus on Christ and from contemplative prayer. One may well ask: Where did the Mystery go? 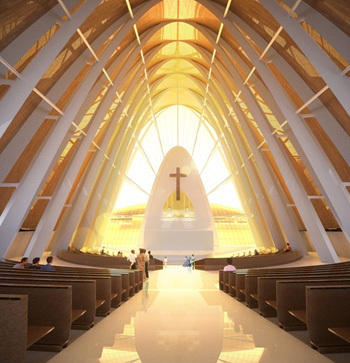 For while the mind is concentrating on these sundry distractions and novelties, and while the people are busy thinking of themselves, the whole focus of the Easter Vigil – contemplating the Death and Resurrection of Christ – is pushed aside. 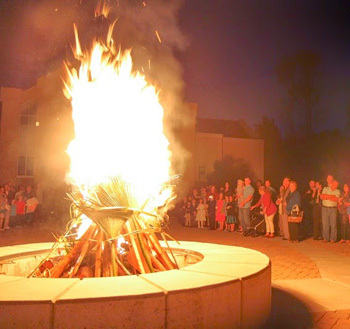 In other words, in spite of the pyrotechnics (huge, leaping bonfires lighting up the night sky, the plethora of flickering candles in a darkened church), the effect could hardly be described as a flood of illumination into the soul. But, what we do know, however, is that the Church had been remarkably successful throughout the centuries in providing for the sanctification of the faithful in the Mass and the Sacraments, as evidenced by the countless saints and pious souls who had received their spiritual sustenance thereby. For, the traditional lex orandi was the single most effective vehicle ever devised for achieving that goal – which raises the question as to why the reform was considered necessary in the first place. Yet, these innovations, despite their manifest flaws, were given exclusivity and predominance over the tried and tested rituals of Tradition. The 1956 Renewal of Baptismal Promises was not without inherent problems in comprehensibility, notwithstanding the use of the vernacular, which was supposed to make the liturgy easier for the people to understand. The fundamental problem is the corporate nature of the so-called Renewal in which the people respond in the plural, “we do / we believe,” when asked if they renounce Satan and accept certain articles of the Faith. To begin with, no one can confess another’s faith, for no one ‒ apart from God ‒ knows what all the others actually believe. What one believes may be different from what the person next to him believes, so that “we” may not always be of one mind. Similarly for the promises: as they presuppose the full consent of the individual will, no one can vouch for others in the congregation who shout out promises they may or may not sincerely mean. Clearly, then, the Renewal of Baptismal Promises raises problems of an epistemological nature, which illustrate the incoherence of the reformers’ avowed intention to create a “more meaningful” liturgy to enable the “intelligent participation” of the laity. It also highlights the futility of giving the congregation a vocal role in the liturgy. Some traditionalists, wishing to continue the 1956 reforms while at the same time realizing the spurious nature of these community-based activities, switched to the use of “I” instead of “we.” But they do so on their own initiative, for the plural forms in Latin ‒ abrenuntiamus (we do renounce) and credimus (we believe) ‒ are contained in the 1962 Missal. It is noteworthy that the response abrenuntiamus – a six-syllable tongue-twister that many people could only pronounce with difficulty and after much practice, while some could not manage to do so at all – can hardly be said to lend itself to congregational participation. But this was of little concern to the reformers, however, who were aiming for a vernacular liturgy. Godfrey Diekmann, The Easter Vigil: Arranged for Use in Parishes, Collegeville, Liturgical Press, 1953, p. 3.